Damn, guys. I just updated this. 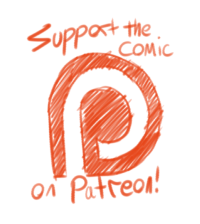 I’m considering kicking the donation goal back up some, but I’ll wait one more page in case this is a fluke. I need a little time to draw more pages. I think it's probably because the last page ended on a cliffhanger. I love that Liam is like in-game Sniper and has slightly longer canines in panel four. I just read this in my email, and flailed a little. Then I read page 9 and flailed a whole lot. And can I just say, panel 2 is like epic levels of awesome. It just looks FANTASTIC, and Gabry's fleeing self looks awesome. Ooh Gabry. You chased after someone with a gun and weren't worried about getting shot at? SILLY MAN! I like how you're alluding to TF2 with the whole 'same company but two teams.' Perhaps they're competing to see who can slay the most demons/undead/etc? Also, where can I get a zombie inspector license? Liam I want your coat. So badly. Seriously. I…I really want a coat like that. Anyway I love the facial expressions in this page. oh hey, they look friendly already. It's pages like this where you really see how far the art skills have progressed; the action panels are lovely here. I have a theory to why you got so many donations so quickly. It was the beginning of the month, people got paid and decided to donate. How come you're Kytri on here and on Worst Idea but you're Heironymus on Cuanta Vida? Because I'm Kytri everywhere except for the CV site and Steam. Gabry you just gave out your client's name. Who the hell is Mr. Mortimer. Is he a professional matchmaker. Or Mortimer is the necromancer they're here to stop and more than one person wants him dead. He double-booked his appointment…TO DIE! I'm sticking with my theory that Rojo is the necromancer. It would make some sense: Morte = death in many languages. "The Hound of the Baskervilles" Mr. Mortimer? that's what came to my mind when I read it. Comparing you style when you first stared CV and looking at the panel 2 here, it's incredible how far you've come. That panel is good enough to be a poster. Also, I agree with what someone said farther up: people are getting paid, so they're donating. I always suspected that the reason it was slow going earlier was due to people saving up for presents. Now that most have already bough presents, they can go back to regularly scheduled luxuries, like this gem here. Man, Gabry acting professional is so great, he's so suave. 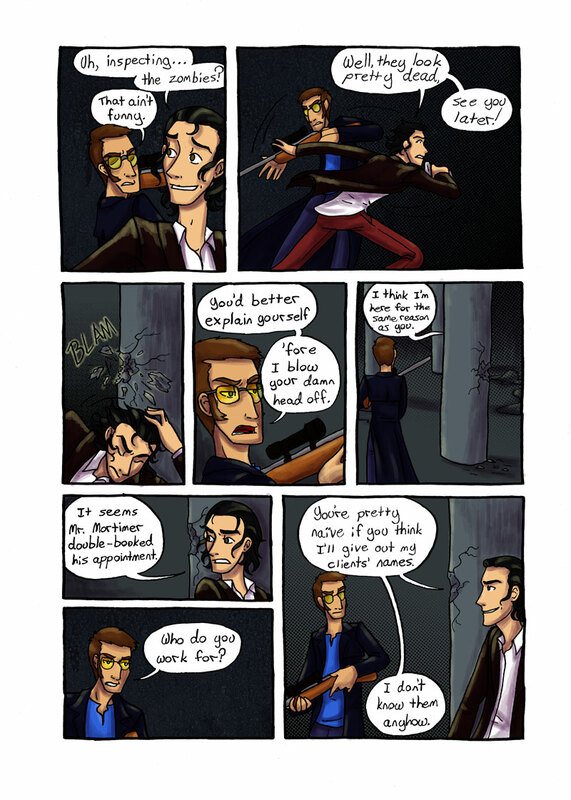 Zombie inspector indeed….fourth panel Liam is also very cool. Everybody is cool in this page, thumbs up for all.